With a ground-breaking extension feature getting rolled out next week (for more details from the league office, take a look here) Reality Sports Online GMs have been scurrying around for inside information like the Duke brothers seeking out the Frozen Concentrated O.J. insider crop harvest report in Trading Places. 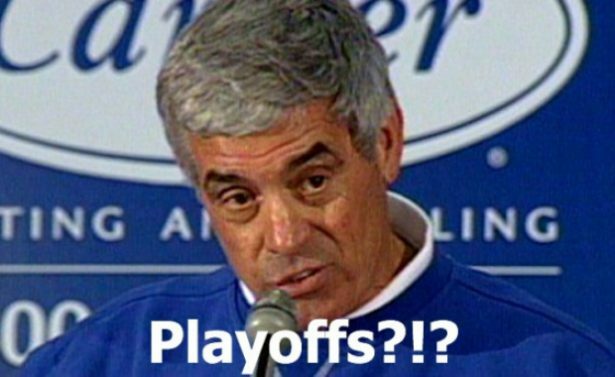 While this article may not have much about the “secret sauce” that factors into what offer your expiring players are receiving from Weeks 5 to 13 this season, treat this as a comprehensive strategic approach to making contract extension decisions. These are my opinions and advice based on the information I have about extensions. Just like you, I’m not swimming in insider information. I have, however, put a lot of thought into devising the methodology to approach this decision with. Feel free to use these thoughts, critique them, ignore them and question them on Twitter . Either way, remember that the RSO guys have created something innovative based on the Moneyball mindset that may require a few kinks to be worked out early on. So if you encounter any type of issues, please be kind and patient (and refrain from social media negging) because this platform is infinitely better than what you were playing before and I’m saying that as a customer. As a disclaimer, I’m not certain I’ll be using my one league voted in-season extension this season as I tend to be a free-market guy who would prefer to see what is going on in the auction. Being somewhat conservative, I haven’t yet been saddled with many “bad contracts” in my leagues that I haven’t been able to get out of, and ultimately that’s the biggest risk an owner faces with these extensions. The biggest risk the RSO guys face with extensions is actually the polar opposite-having the algorithm spit out too kind of a deal for extensions. Remember that when you see your initial offers. The Airline Ticket Purchase Analogy– When you are looking at taking a trip and booking flights, you don’t keep searching prices after you’ve already purchased the ticket. Likewise, you don’t get on the plane and ask the person sitting next to you how much they paid for their ticket. So, in similar fashion, if you have extensions enabled in your league and you like the price/years offered for an expiring player the first week it is offered (note that only your team can see the offers your player is getting on your team page) and have the requisite cap space in future years to do it, pull the trigger and don’t look back. Also, with the “everything is an asset” in an RSO league caveat-if you as an owner are transparent about what your player offers are to other owners, you may be able to work out a favorable trade with them. 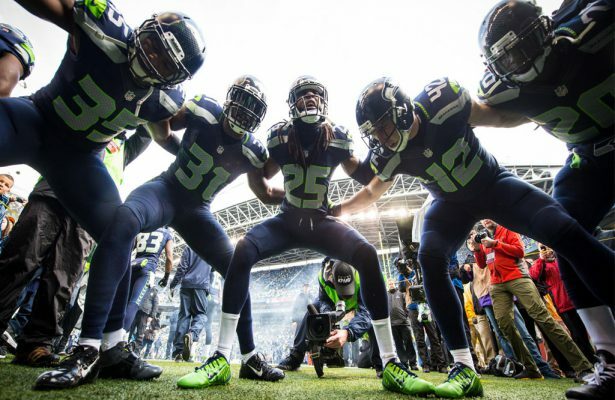 What’s Your Benchmark?- Since the only other viable extension opportunity for you is the franchise tag, that is a number you are now forced to know like the back of your hand for every position you have on your roster. If you haven’t calculated the Top 5 positional average for players in your league under contract for 2018 yet, you are already behind. If you are behind, don’t worry, it is not hard to calculate that average by position. Remember, that the franchise tag for your player by position is the HIGHER of the Top 5 positional average or 120% of your current year salary for that player. The franchise tag does have a term limit of being used twice and obviously has a multiplier effect of 120% if you’ve used it once already. That said, you should always be comparing your annual average value of your extension offer to your franchise tag cost for the upcoming year. If the extension offer is cheaper for the player of need, that may be an indication that you want to extend that player. I’ll predict that with potentially high extension price tags and future increases to auction prices (see #3) that the franchise tag will be a more strategically used asset across leagues in the future. Predicting Future Auction Prices- I’m saying this for those who have been on the RSO platform for a short period of time where the talent in free agency hasn’t turned over much in leagues due to rookie contracts not expiring, etc. 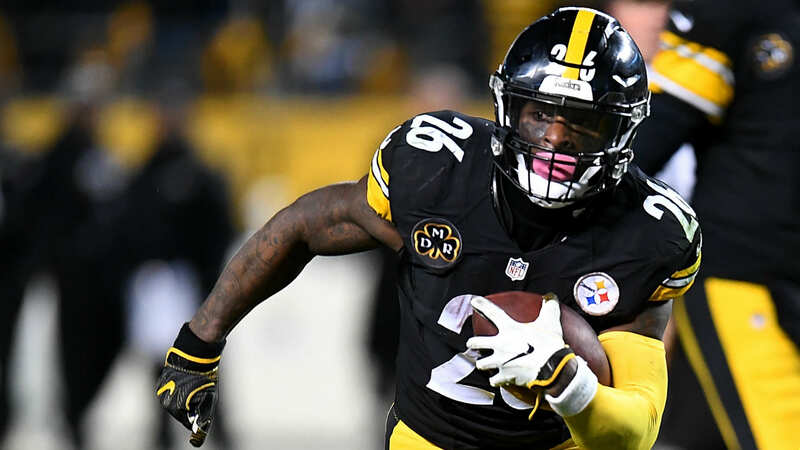 Just like you have certain expectations of what someone should cost prior to the auction via your prep, the real auction takes twists and turns and gets more unpredictable as players like Antonio Brown and Rob Gronkowski become free agents for the first time in your leagues. Add that into a dynamic market where several teams are coming into the auction with significant ($100m +) cap space and you get scenarios like my main league where Brown went on a huge contract for 4 years, $243.5m. Then, when a few players trickle back into the auction and teams have bountiful cap space, you see overpayments being made for players who don’t deserve as much as they are getting. That’s where your perception of where future auction prices are headed can benefit you in looking at extending players. I’ll talk about this more in a bit, but it really is about getting over the initial “sticker shock” of the extension offers. 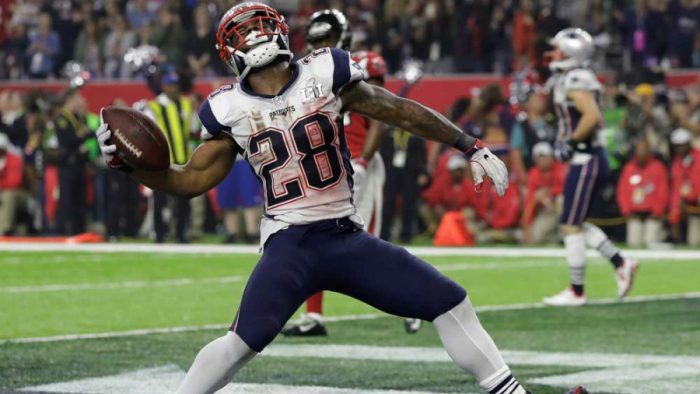 Sticker Shock and What To Do With It- When you’ve paid a rookie that you sneakily drafted early in Round 2 of your 2014 rookie draft like I did with Devonta Freeman around $1.5m a year for four years, any contract extension offer is going to seem astronomical. Don’t let it be. Of course, Freeman’s rookie contract is well under market value and his extension offer may be more than what you perceive market value to be. Likely, it will fall somewhere in between. So you’ll likely need to “check down” against what someone like Freeman’s franchise tag # would be in 2018 (of course that’s the summer vs. an in season extension). This is exactly what I’m going to do in Week 5 when the initial offers come out. 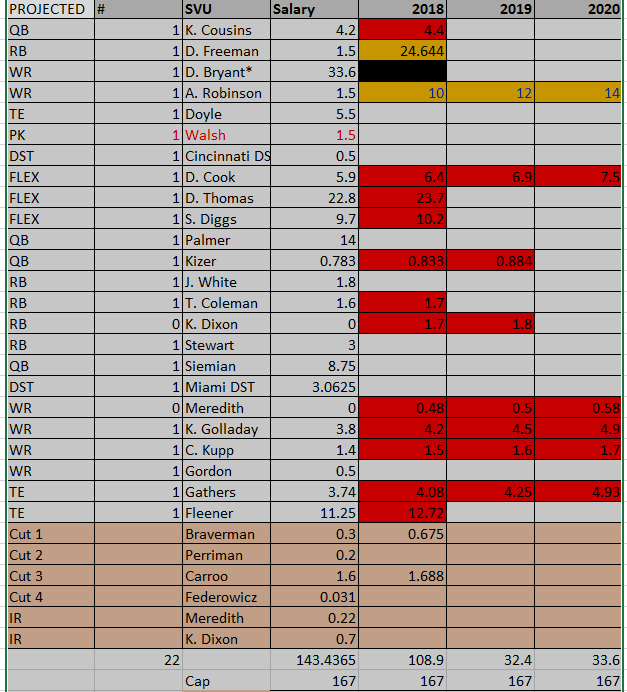 Here is an inside look at a spreadsheet I use in my main league to look into future use of franchise tags and extensions. If you don’t have a template like this, you don’t have to be an Excel whiz to set one up. Note that my calculation for Freeman’s tag is based on the Top 5 positional average for running backs. I’ll try to explain more about Allen Robinson later as I’ve already been approached by one owner who is trying to figure out what to do with him this season (NOTE: I have not seen any offers for Robinson and just put these salaries in as a placeholder that may not be realistic). For current rookies or players without much history on their side that have performed well thus far this season, the algorithm has a very small sample size and the offers are likely to be outside of your comfort zone. If you think that someone like Tarik Cohen has league star written all over him, feel free to accept the offer coming his way. I personally would lean on a larger sample size and take my chances in an auction, but one thing you have that the others in your league don’t is current control over that player. From what I gather, age of player is a definite component of the algorithm that determines extension values and contract lengths being offered. 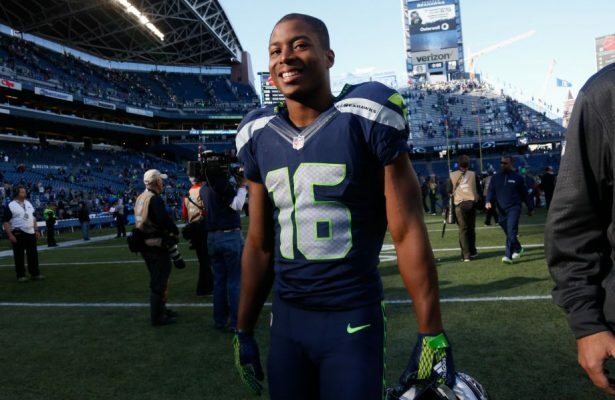 If you’ve seen players like Brandon Marshall fail to separate from DB’s lately, you’ll know that you don’t want to give too many years or dollars to someone on the backside of their career. At the same time, consider some pivotal ages for your wide receivers and running backs. I typically would view 33 year-old receivers as one year guys with few exceptions (this is when a player like Andre Johnson experienced his decline). In terms of running backs, I’m not giving any running back over the age of 27 more than two years. 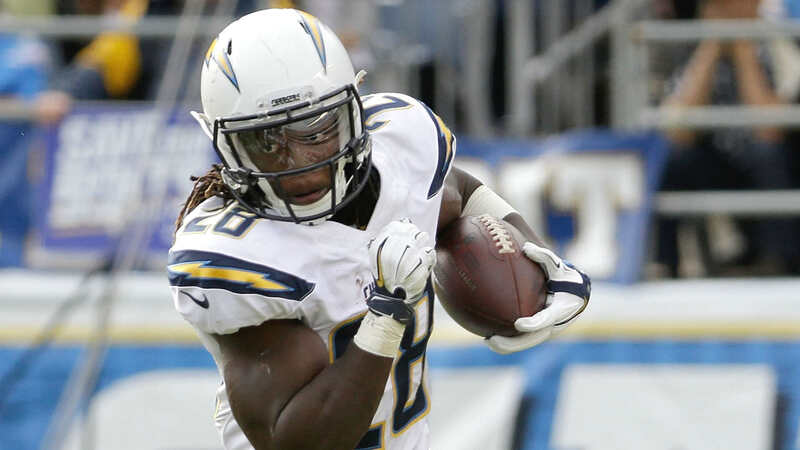 If you’ve noticed the running back leaders this season in fantasy points, you’ll see that rookie running backs and guys like Todd Gurley and Freeman sit atop the board and they are all 25 and under. I know there are exceptions to every rule/player, but remember you are in essence via the extension bidding against yourself here and not the market. With likely high prices across the board for extension players, to hit a home run on one, you’re likely to be taking on significant risk or finding value in the marketplace. With that, I think creativity is important and that would include taking a look at players who were already injured this season and are out for the season. Guys like Cam Meredith and the aforementioned Robinson. Let’s dig deeper on Robinson since I’m facing this very decision. 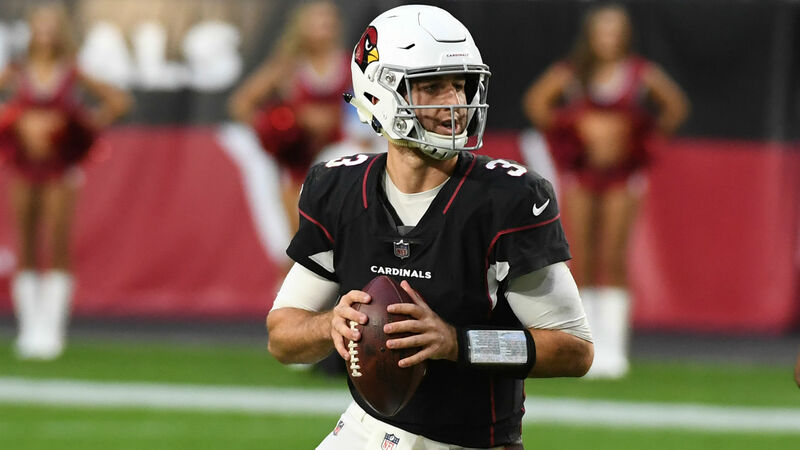 The good: he doesn’t turn 25 until next August, has a monster season under his belt that was two years ago (80-1,400-14), already had surgery a day after his ACL injury with no other structural damage and is a potential real-life NFL free agent this offseason. He also has no other NFL injury history. His 2017 stats were 1 catch for 17 yards before his unfortunate injury. 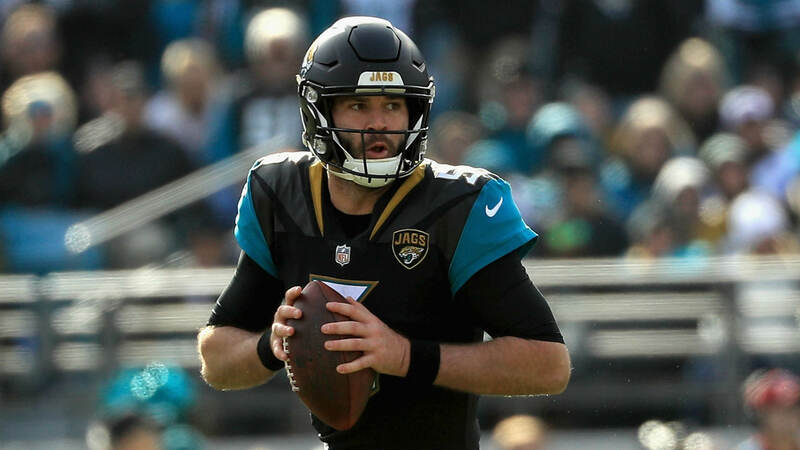 The negatives other than the fact that he was injured include his quarterback Blake Bortles not being able to optimize his talents, his 2016 stats being a down year (73-883-6), his Jacksonville Jaguars head coach being uber-focused on the running game, and this injury. 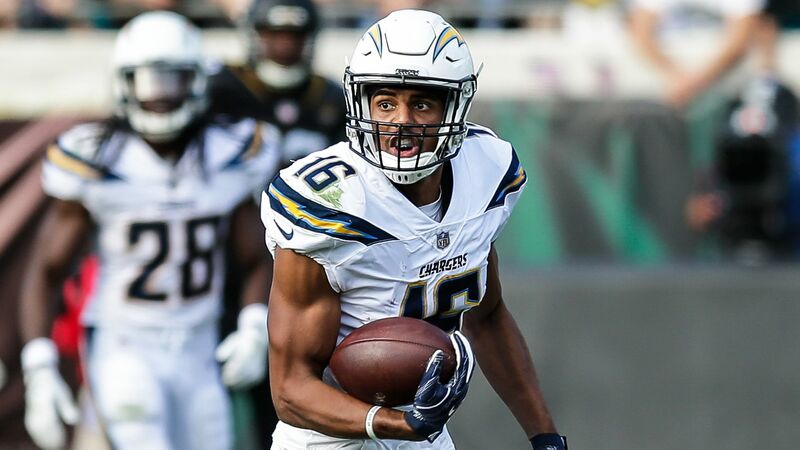 However, from an extension standpoint, there may be an opportunity to arbitrage here as most of Robinson’s negatives can be viewed as positives from an extension standpoint. Taking into account that Robinson hasn’t produced at an elite level in two years would seem to mean that you could be getting him at an extension number that shows there’s future uncertainty in his outcomes. 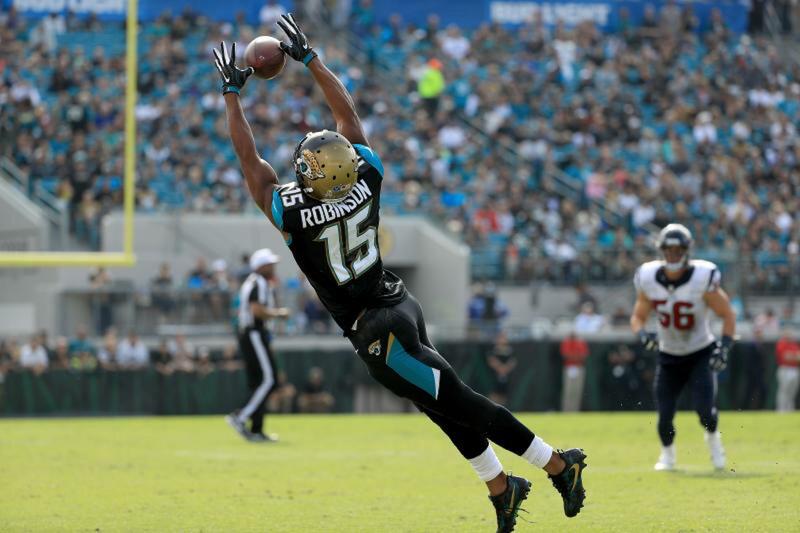 Yet, Robinson figures to be back playing for the start of the 2018 season and potentially on a new team (or with a new QB other than Bortles). 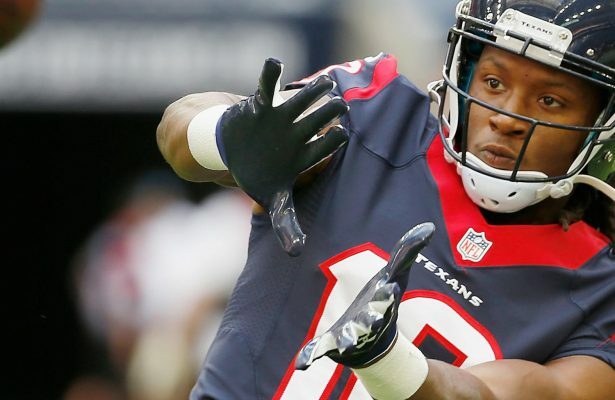 He could be on a “one year prove it deal” with Jacksonville or elsewhere and based on his size, speed and skills, should be able to get back to being a top 20 wide receiver. So taking into account the likely lack of fluctuation in his weekly offers due to his 2017 being over, his subpar 2016, and some future uncertainty, you may be able to get Robinson for way less than if he was coming off of an all-pro season. Additionally, since you can extend players who occupy your injured reserve space, you can get the benefit of not having to occupy a valuable 2017 roster spot with Robinson. Not sure what the offers will be for Robinson, but I think anything over $20m a year starts to get me out of my comfort zone based on the fact that much of his uncertainty won’t clear up until the offseason and you have to decide by Week 13 what you are doing with him. Other than injured players, you may want to look a mid-tier tight ends for potential extension value as well as the position is typically viewed as having less skill. OK, folks, hopefully this methodology guide on how to approach extension decisions will be helpful to you this season and down the line. Remember, you don’t have to use the extension, so make the decision that best works for your team’s current and future success. Matt Goodwin is in his fourth season as senior writer for Reality Sports Online and is in year five of his main league. He also contributed for numberFire for several years. He is an avid sports fan from Cleveland, Ohio who would count a Cleveland Indians World Series victory a close second behind getting married to his wife Renee and the births of his children, Jory (7 year old son) and Lainie (3 year old daughter). Matt loves mid 90’s hip-hop, playing pick-up hoops, traveling, Ohio State football and Arizona basketball, watching Glengarry Glen Ross for the millionth time and being outside the few months it doesn’t rain in Seattle where he lives. He can be found on Twitter @mattgoody2 and hopes you continue to read his In the Zone articles and take his side when he’s debating player value with @RobertFCowper. 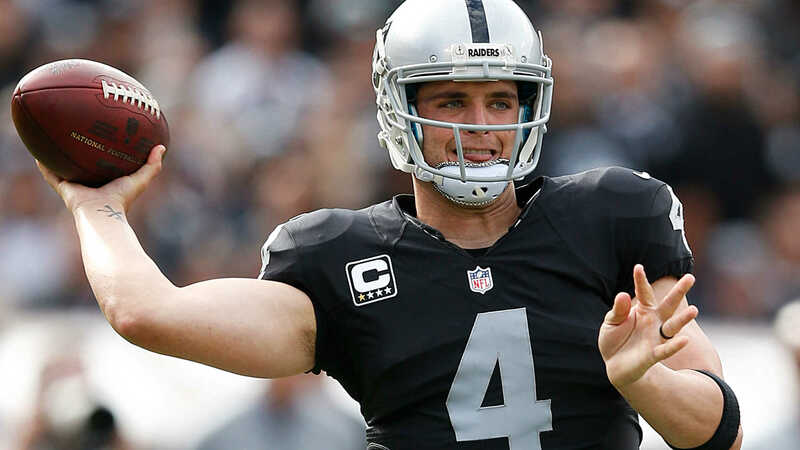 The RSO salary cap and contract structure provides a unique setting when compared to other fantasy platforms. A superior player with more expensive contract will be worth less in many instances than a lesser producing player with a cheaper contract for RSO leagues. RSO rookie deals give owners access to cost-controlled, long-term contracts. The question is whether rookies produce enough of the time to be worth the costs involved. 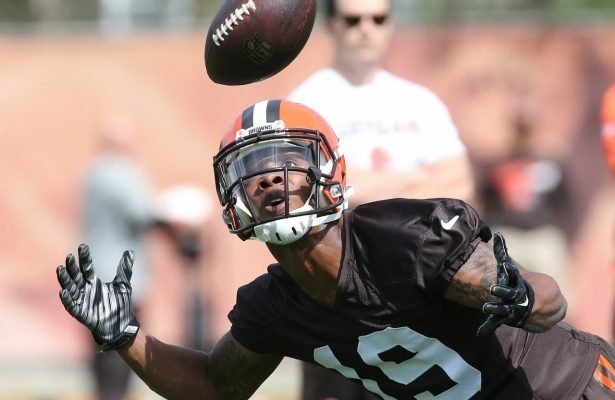 This article continues our examination of RSO rookie draft picks from Part 1 looking at the basics of evaluating picks for RSO leagues. 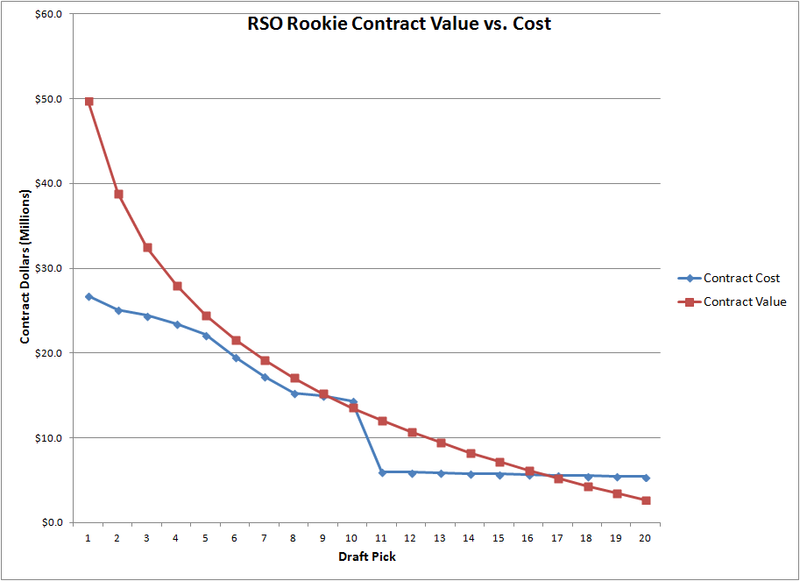 Part 2 expands upon this by comparing the expected production value of rookie picks with the associated RSO rookie contract costs. We can then ascertain where the best bargains can be found and relate draft pick costs to veteran spending. While there is no superbly accurate means of determining how a rookie will turn out given the many variables outside the control of the player and the host of intangible player traits which determine success, but the model below should give the reader an idea of how to value rookie picks. This section details the technical aspects of my value formulation. As a quick reminder, the values obtained come from shallow, non-PPR leagues. The reader may refer to part 1 for more information about the data. I first converted the player values in part 1 to dollar values based on the salary cap and league settings specified above. My next step involved weighting player values by the year in which production occurred using a 20% yearly discount rate unless noted otherwise. People generally prefer production in the present when compared to production in the future. An example may help to illustrate the point. Given one rookie who produces only in year 1 of a rookie contract and another rookie who produces equally but only in year 4 of the rookie deal, most RSO GMs prefer the rookie who produces in year 1. There is another more tangible reason to discount the production in future years. You might not be in your RSO league in future seasons. Maybe the league breaks up. Maybe your life circumstances change so that you are no longer able to compete in the league. As shown in part 1, draft picks tend to produce more after the rookie season. The RSO GM is generally receiving less production in the rookie season compared to later years but paying the same price as a percentage of the salary cap. I finally summed the time-weighted values to form an associated present day value for each player. Lastly, I estimated player values for each draft position using a linear-log regression model. 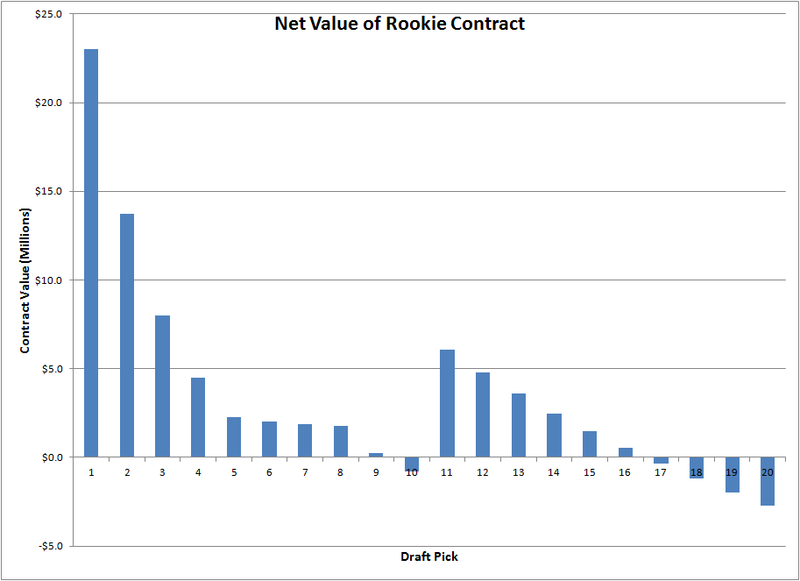 The estimation utilized players selected from 2007 to 2013 rookie drafts. Players selected from 2014 to 2016, included in part 1, were excluded in this analysis as they have not completed their rookie contracts. Reality Sports Online posts rookie contract costs for drafts up to five rounds. Similarly to player values, I converted contract costs to present day dollars in order to compare rookie draft costs to values. There are a few key items worth mentioning after examining the costs. First, there will be a sharp drop in rookie costs from the last pick of the first round to the first pick of the second round. Second, contract costs remain relatively “flat” after the first round. There exists little difference in costs from 2.1 to 2.10 for example. Third, contract costs grow yearly at a rate which should adequately approximate the yearly salary cap growth in the NFL. 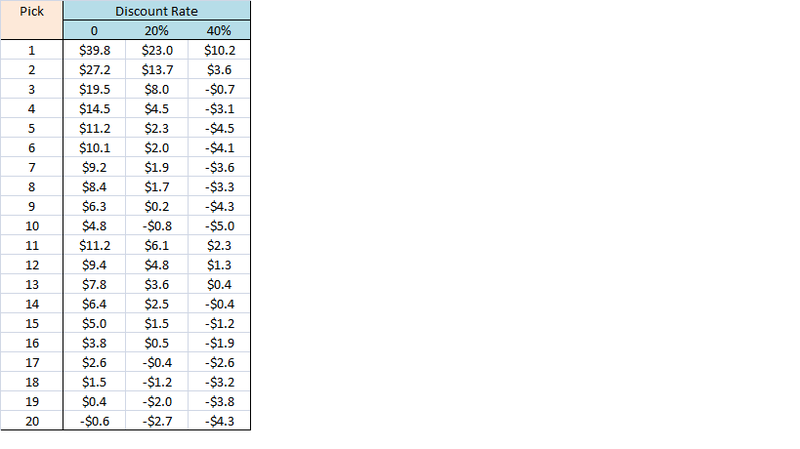 This means rookie picks should take up approximately the same percentage of cap space for each year of the contract. The data also presents interesting notions on the relative value of draft picks. The 1.1, for example, is approximately equal in production value to 1) picks 4 and 5 or 2) picks 7 to 9 or 3) picks 9 through 12. The massive premium attached to top picks seems quite reasonable when looking at the expected production. If we want a better a look at how good a rookie contract is, however, we need to take into account the associated costs with each rookie deal. The next section details this further. The net contract value is simply the contract costs subtracted from the contract value. A rookie contract with a net value of zero is expected to produce at the market value rate. As seen from the chart above, rookie deals as a whole tend to be good contracts to owners with 75% of the picks having positive net values and the remaining picks producing minimal losses. In particular, rookie picks near the top of the first and second rounds substantially out-produce their contracts. This is primarily a result of large production from the top picks and the big drop in rookie costs starting with second round picks. Of course not everyone values future production of players in the same way. It becomes readily apparent from the table above that rookie picks rapidly lose value for those people who sharply discount future production and are focused more on the present. Be sure to understand your personal situation and timeframe before investing heavily in draft picks. The analysis above focused on the production value of rookie picks. Another way to look at the problem is through the lens of what I will call “perceived” value or, put another way, how the rest of your league values draft picks. It is well documented that many fantasy leagues value draft picks above their production value, particularly around the time of rookie drafts. 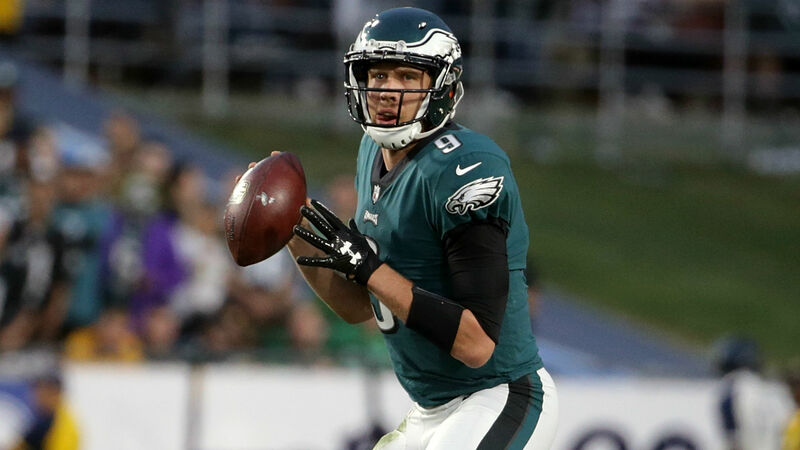 RSO owners, particularly those out of the playoff race, might consider trading for draft picks during the season even if the player values traded away is larger than the received draft pick value. You may be able to translate the short-term loss into a long-term profit near the next rookie draft. The above values for rookie picks are a solid starting point but we also need to remember that not every draft class is created equal. For example, I consider the 2017 rookie class generally superior to the 2016 class with more high-end talent and quality depth throughout. Be sure to adjust your valuations accordingly. Loading up a roster with draft picks can be an effective salary cap management technique. A roster with many low cost rookie picks, particularly after the first round, allows a lot of cap space to spend on high-end starters in the free agent auction. Misses on rookies (of which there will be plenty) will not have too big of an impact thanks to the low costs involved and gives the RSO GM substantial cap flexibility in the future. While every RSO GM is different, there are a couple of key points to keep in mind when evaluating rookie picks. Rookie pick value is maximized near the top of the first and second rounds. Try to trade up, down, or out if you have picks in the bottom portion of the round. 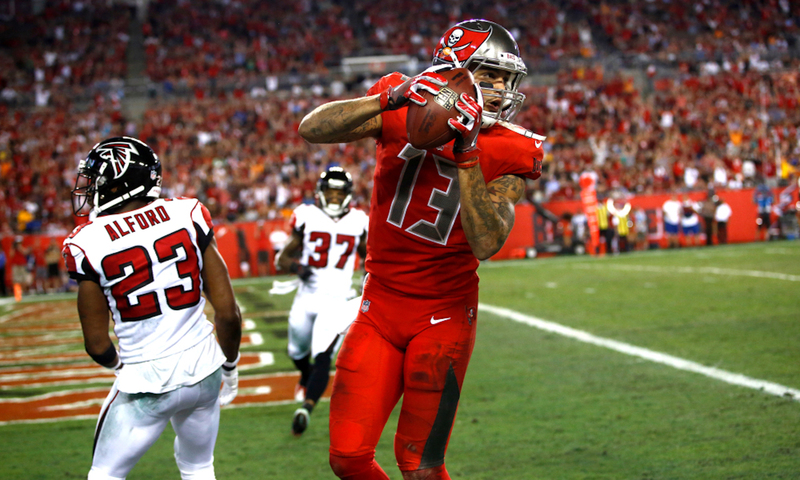 Picks at the end of the second round and later are essentially “throw away” picks which have net values near or below market value. You are better off using your cap space in the free agent market. Know yourself and the league when evaluating draft picks. Rookie pick values increase substantially in stable long-lasting leagues for owners who hold a longer-term outlook. The RSO team with a shorter window should seriously consider trading away rookie picks. You are currently browsing the archives for the Football Administration category.